Pew’s recent poll, A Portrait of Jewish Americans, showcases the essential duplicity of jewish identity. The poll, conducted by Pew Research Center’s Religion & Public Life Project, puts the oldest, best example right out front. They distinguish two main types of jew: “jews by religion” and “jews of no religion”. One of the first decisions that had to be made in conducting this study and analyzing its results was to answer the question, “Who is a Jew?” This is an ancient question with no single, timeless answer. On the one hand, being Jewish is a matter of religion – the traditional, matrilineal definition of Jewish identity is founded on halakha (Jewish religious law). On the other hand, being Jewish also may be a matter of ancestry, ethnicity and cultural background. Jewish Crypsis – Half-Jews – Part 2 goes over the issue of matrilineality and the biological nature of jewishness in more detail. Suffice it here to note that even the “religious law” is actually a matter of ancestry. So the “ancient question” does in fact have a “single, timeless answer”. Being jewish is, and always has been, a matter of ancestry. All along the jews have also pretended otherwise. The primacy of ancestry comes through in the flowchart Pew uses to describe how they categorized poll participants. Those who “were raised jewish or have a jewish parent” but profess no “religion” are counted as jews. Those who claim no jewish parent are excluded, even if they regard themselves as jewish. Nearly all Jews say they had at least one Jewish parent, including 96% of Jews by religion and 97% of Jews of no religion. All in all, 98% of Jews (and, by definition, 100% of Jews of no religion) were raised Jewish or had at least one Jewish parent; 2% of Jews had no such background but indicate they had a formal conversion to Judaism, while 1% did not formally convert. In other words, jewishness is 96-97% a matter of ancestry. U.S. Jews see being Jewish as more a matter of ancestry, culture and values than of religious observance. Six-in-ten say, for example, that being Jewish is mainly a matter of culture or ancestry, compared with 15% who say it is mainly a matter of religion. Roughly seven-in-ten say remembering the Holocaust and leading an ethical life are essential to what it means to them to be Jewish, while far fewer say observing Jewish law is a central component of their Jewish identity. And two-thirds of Jews say that a person can be Jewish even if he or she does not believe in God. More than four-in-ten U.S. Jews (46%) say being Jewish is a very important part of their lives, and a third (34%) say being Jewish is somewhat important to them. One-fifth of Jews say that being Jewish is not too (15%) or not at all important to them (5%). Jews by religion are nearly five times more likely to say being Jewish is very important to them compared with Jews of no religion (56% vs. 12%). Nearly nine-in-ten Orthodox Jews (87%) and two-thirds of Conservative Jews (69%) describe being Jewish as very important in their lives. Far fewer self-identified Reform Jews say being Jewish is very important to them (43%). Among Jews who are unaffiliated with any particular Jewish movement or denomination, just one-in-five say being Jewish is very important to them (22%). More than nine-in-ten Jews (94%) agree they are “proud to be Jewish.” Three-quarters (75%) say they have a strong sense of belonging to the Jewish people, and about six-in-ten (63%) say they have a special responsibility to care for Jews in need around the world. Overwhelming majorities of both Jews by religion and Jews of no religion say they are proud to be Jewish (97% and 83%, respectively). 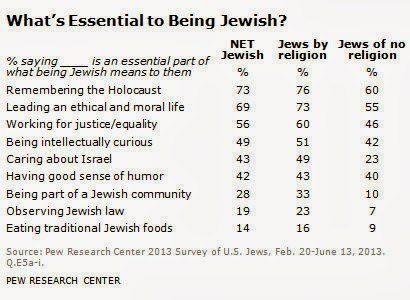 Most Jews by religion also say they have a strong sense of belonging to the Jewish people (85%) and that they feel a responsibility to care for Jews in need (71%). Far fewer Jews of no religion share these sentiments. The survey asked Jews whether each of nine attributes and activities is essential to what being Jewish means to them, is important but not essential, or is not an important part of what it means to be Jewish. In response, roughly seven-in-ten U.S. Jews (73%) say remembering the Holocaust is an essential part of what being Jewish means to them. From this it’s clear that jewishness is more about peoplehood than religion, more biological than ideological. In fact the ideological portion is just another facet of the biological portion. In spite of their many profound ideological differences, the core beliefs that jews share most religiously have to do with seeing themselves as part of and concerned for the well-being of their people, a biological collective. Theologically speaking, note that the jewish collective sees God as unnecessary but regards their guilt-tripping and extortion narrative as essential. Jewish Crypsis – Half-Jews – Part 3 is further commentary on the Pew poll in the broader context of my recent series of podcasts focusing on jewish identity. Did you read the attached comment thread? I noted where several of our Ancient Friends upbraided Svigor for not realizing that jewish outmarriage rates obviated the premise that they were at war with whites. You see, the universal lust for white women clearly indicates a love of our people–as the behavior of feral fornicating negroes amply demonstrates. And if jews were anti-white, would they pursue shiksas? No True Jewsman! I littered a comment there to this effect. Unfortunately it’s available only to Sailer premium members, who have full access to a burgeoning catalogue of paywalled Porter content. Svigor’s comment at Pew’s big survey of Jewish Americans is very good. It was in my mind when I discussed “the tribe” in tonight’s podcast. Kudos to you both for putting up with Sailer’s Komment Kontrol. I know from personal experience that Mister “human biodiversity” isn’t keen on comments highlighting White and jew biodiversity. I know you don’t take requests but it would be great if you could discuss jihadwatch & Co dropping the EDL. The utter confusion (for reasons of JQ myopia) at jihadwatch and GoV is fascinating to watch. Thanks and looking forward to reading you.